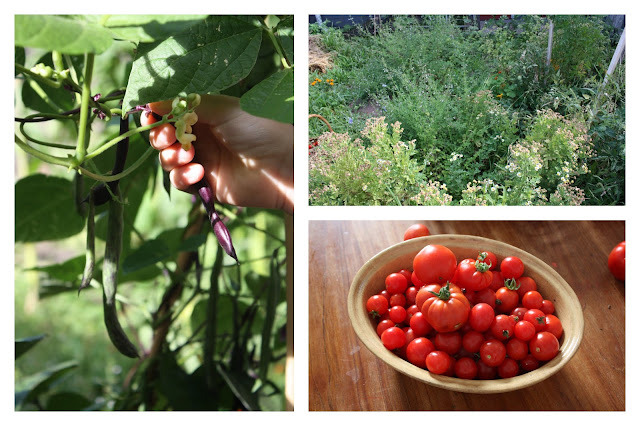 For the first time ever, we actually have an abundance of home grown food. I was a bit unsure of what we would find upon our return from our holiday. Our lovely neighbours (who have an amazing inner city veg garden, which I believe will be in an up and coming issue of Inside Out magazine) came in and tended our small patch for us. We were delighted to see that our plants were still loaded with produce and the girls raced in to pick away with delight, before we even had unloaded the car. First thing in the morning, still in jarmies, they are out there looking for what is ready. We are still learning what will grow best where and how to actually care for them but when we can see the results from our efforts of digging in all that manure and compost, there are smiles on faces. I'm thrilled that the girls are learning the importance of real food grown organically and it comes in all shapes, sizes and colours, not like those plastic perfect specimens you see in the supermarkets. We've had them fresh on toasted sourdough for breakfast. Popped straight in the mouth while picking. Slow roasted in the oven, then placed on top of creamy polenta with our lightly steamed beans. The flavour is just amazing. Yum!!! Now the wait for our figs to ripen. Enjoy eating all of your tasty and lovely looking produce! Home grown fruit and veggies are the best....glad your garden survived while you were away....what fun to come home and see what was ready for picking. Great to see your girls so excited by growing vegies! We're very new to the "vegie patch" but home grown zucchinis are the order of the day around here! !